The Float Level Switches FS00 work according to the lift principle. A hollow float is raised by the rising liquid until it reaches an angle of 45 ¡ from horizontal when switching takes place. The mercury free float switch can be mounted to the tank or container via a through hole such as a 1/2″ cable gland or from the tank top.The switch point is defined by manipulating placement of an optional ballast weight on the connecting cable or by inserting cable through a tube of the desired length. The FS00 level switch consists of a polypropylene housing with an integrated watertight and position dependent electromechanical microswitch. Cable connections from different materials and in different lengths may be chosen to suit the medium and tank dimensions. 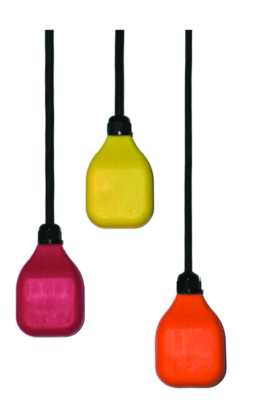 The FS00 float level switches are compatible to virtually all liquid media which do not affect the materials of the switch or cable. The unit is not affected by pollution of the medium. The FS00 may be used as MIN, MAX monitor, to control valves or pumps or as an alarm switch.